This slot, brought to you by NovomaticCasino.co.uk, is an absolute gem that’s full of gems! This is a slot worth trying for fans of our other slot games, like: Jackpot Diamonds, Jewel Action and Sizzling Gems. The old-school music and sound effects combine together with familiar symbols to create a classic-style online slot that’s addictive, engrossing and extremely entertaining. With 5 reels and 20 paylines, there are plenty of ways to win! It’s a really great slot for regular players who are looking for something classic and not too fussy or complicated. Also, it’s a great one for beginners who are looking to upgrade from a simple 3-reel, 5 payline slot but who don’t want to get too confused with having to wrap their heads around complicated rules or convoluted bonus games! Most of us have only ever dreamt of being lost in a sea of gemstones, or finding a chest full to the brim with glittering jewels. With Just Jewels Deluxe, you can see them light up and colour your screen and make you feel as though you’re swimming in them! The symbols include: sparkling sapphires, effervescent emeralds, alluring amethysts and radiant rubies! The higher-paying symbols are golden bullions, straps of cash and a stunning, royal crown. The aim of the game is to spin at least three matching symbols across the reels, adjacent to one another and on a winning payline. Unlike many other slots, Just Jewels Deluxe pays wherever they fall adjacently, not just left to right! However, three or more Scatter symbols, which are golden Euro signs, pay wherever they fall on the reels. Like many other NovomaticCasino.co.uk slots, you can play Just Jewels Deluxe for fun before you’re ready to play for real and win the big bucks! If you like, once you’re familiar with the game, you can put it in ‘autoplay’ mode, where the reels spin themselves, to save you from having to keep clicking and clicking and clicking! The game clearly shows your balance, your winnings and your bet amount at the bottom of the screen. To change your bet is really simple and easy, and you can either increase or decrease the number of lines you wish to bet on, as well as the amount you wish to bet on each line. If at any point you’re unsure of how much each winning combination of symbols is worth, you can check the paytable to see the exact amounts and also the rules and more information about the game. 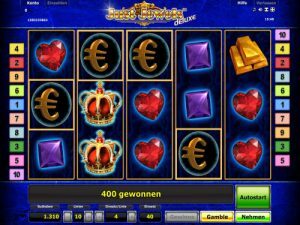 Just Jewels Deluxe also has the trusty 50/50 double-or-nothing gamble feature which means that each and every time you get a win, you’ll be in with a shot of doubling it. In this slot, you’ll need to correctly guess whether the next card to be turned over will be a red one or a black one. If you guess right, you’ll get x2 your win and you can keep going to get x4, x8 x16 or more! If you guess incorrectly, however, you’ll be back to the reels without your original win. Aside from Just Jewels Deluxe, there are many other treasured gems to be found amongst NovomaticCasino.co.uk’s epic selection of games. We have plenty more slots and video slots, as well as some lucrative table games and some extra-special live dealer games. Our live dealer games, such as: Live Blackjack, Live Roulette and Live Poker, are brought to you using the latest technology so you can log on and play from your home, yet feel as though you’re right there in the middle of the glitz and glamour of a real casino. You’ll almost hear the dice rolling, the cards shuffling and the cheers and shouts of lucky players winning big at the tables. Why not check them out? You never know whether you’ll like them until you try!